Proven reliability with houseboat rental fleets has made Westerbeke the "standard of the industry." Westerbeke, the first company to bring constant speed EFI generators to the marine market introduces the first low carbon monoxide generators. Westerbeke low-CO gasoline "houseboat series" generators dramatically cut carbon monoxide emissions. Now you can breathe easy! All Westerbeke low-CO gasoline generators feature electronic fuel injection (EFI). EFI provides optimum fuel efficiency, easy starting and improved reliability. In conjunction with EFI, electronic speed control (via electronic governor) maintains the engine at a constant speed (precise frequency regulation) and eliminates "bogging down" when load is applied. Houseboat series generators operate at a quiet, electronically controlled, 1500 RPM. Powered by 4-cylinder, 4-stroke engines that virtually eliminate vibration, the houseboat series gasoline generators are also extremely smooth running. These modern overhead cam engines operate at a slow 1500 RPM for long life and low maintenance. The unique fuel system insures an uninterrupted flow of gasoline to the engine in the high ambient temperatures typically found in generator compartments and engine rooms. 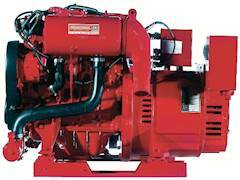 The houseboat series owner can expect more durability and reliability from his slow speed Westerbeke generator set. Customers can also rely on Westerbeke's stellar reputation in the houseboat industry from Lake Powell, U.S.A. to Lake Eildon, Australia. Houseboat series generators are backed by Westerbeke's 5-year limited warranty. The presence of Westerbeke in over 65 countries around the world provides customers with easy access to parts, service and technical support worldwide. Established in 1937, Westerbeke is committed to providing its customers with quality products and unequaled after sales support.